Soothe and calm your skin with Paco Rabanne 1 Million Aftershave Balm. Perfectly complementing the Paco Rabanne 1 Million EDT, the balm incorporates notes of grapefruit, cinnamon, leather and amber. 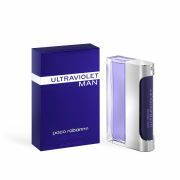 Representing wealth, power and luxury, this decadent aftershave will relieve irritation to leave your skin feeling comfortable. - L.M. Directions for Use: Apply to the face and neck after shaving.